Unlike our 206 tail rotor blade which fits on B3, L series, and OH-58 models, our 206 main rotor blades are designed specifically for each model (JetRanger or LongRanger; OH-58 is still in development). On the LongRanger main rotor blades, we were also able to incorporate customer feedback from the JetRanger blades. Flexibility: The increased flexibility of the 206L blade complements Bell’s Noda-Matic nodal transmission suspension system, which is not available on the JetRanger. The combination of softer blades and the nodal mount dampens the 2 per rev vibration inherent in two-bladed rotor systems. Length/Weight: Matching the original metal blades in length, the 206L blade is 22 inches longer than the 206B blade. 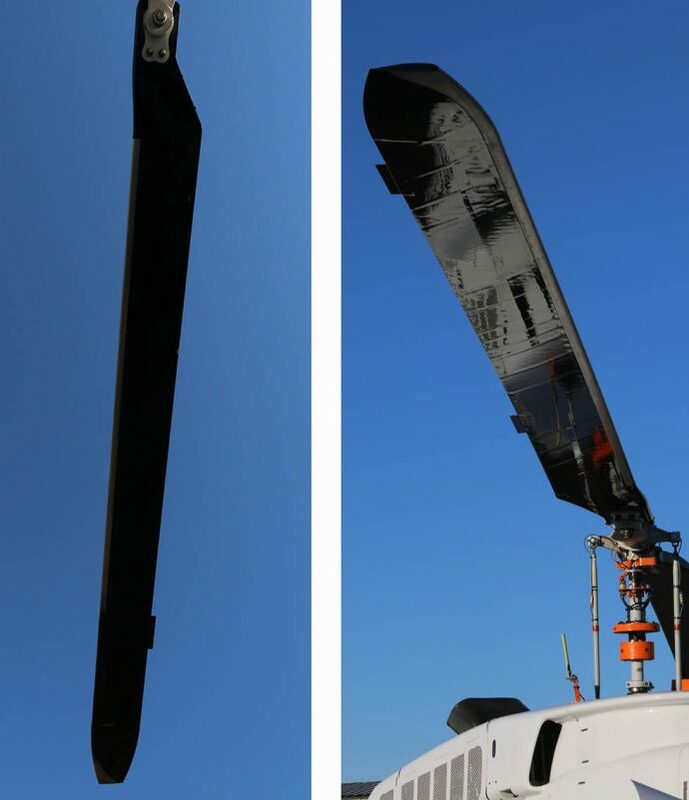 However, our 206B and 206L composite main rotor blades weigh about the same as each other (which is about the same as the original metal 206B blade). Trim Tabs: The 206L blade includes inboard and outboard trim tabs to match existing track and balance procedures of the metal blades; the 206B has one outboard trim tab. Both blades have their own set of polar balance charts. Tip weights: The 206L does not use external tip weights for inertia as the 206B blade does. Instead, the 206L blade uses a different tip block with internal weights. Service life/overhauls: The 206L is certificated with a 16,000-hour service life and overhauls required every 4,000 hours. The 206B is certificated with an 18,000-hour life and overhauls required every 2,800 hours. Another main difference between the blades, which doesn’t have anything to do with the blades themselves, is the supplier. Order the 206B main blades from Aeronautical Accessories. Order the 206L main blades directly from Van Horn Aviation. There is a price difference as well.